Welcome to the 7th wettest start to September on record in the Twin Cities. You think your yard is soggy? 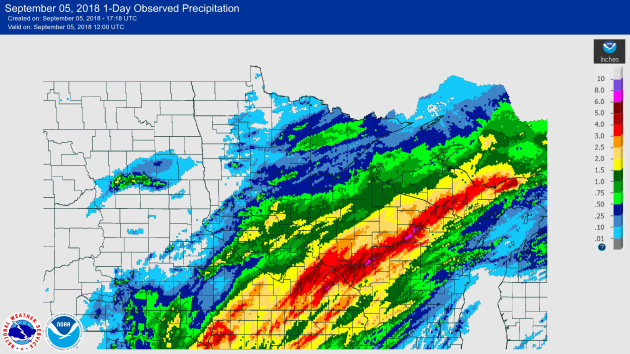 Some towns in southeastern Minnesota picked up 3-6 inches of rain. For perspective, that's nearly 2 month's worth of rain falling in the last few days. Tuesday's downpour made up for a dry July; the MSP area is running about .8 inches below average for 2018. Thunder-wear is optional the next 4 days as we enter a dry pattern. Enjoy puddles of blue sky and comfortable 70s into the weekend, because long-range models show more 80s next week; even a shot at 90F roughly one week from today. It would be premature to pack away the short shorts just yet. September is prime time for hurricanes, in fact September 11 is the date when hurricane landfall is most likely in the USA. To put an exclamation point on that: ECMWF ("European") guidance brings a possible hurricane into the Carolinas or Mid Atlantic region by late next week, where it's forecast to stall for several days. While we track patchy fog and spotty T-showers, residents out east may be keeping close tabs on "Florence". A Close Encounter with "Florence"? This is ECMWF guidance, valid next Friday evening, September 14. The European model is consistently more accurate beyond 3-4 days, but not infallible. This forecast will change over time, but the 228 hour forecast shows a hurricane off the Mid Atlantic coast. Time will tell. Map: WSI. Sweaty September. GFS guidance from NOAA continues to indicate unusual heat for the third week of September for much of the USA, with more 90s and 100s for the southwest and south central USA. Gordon made landfall around 10:15 PM last night near the Alabama-Mississippi border as a tropical storm, but has quickly weakened since. As of Wednesday morning, Gordon was a tropical depression with winds of 35 mph. Heavy rain will continue to be the main threat from Gordon over the next couple days from the Gulf Coast to Arkansas, with the potential of 6”+ of rain in spots. That will have the potential to lead to flash flooding. Meanwhile, across the upper Midwest, a slow-moving frontal boundary will continue to move south and eventually interact with some moisture streaming north from Gordon. 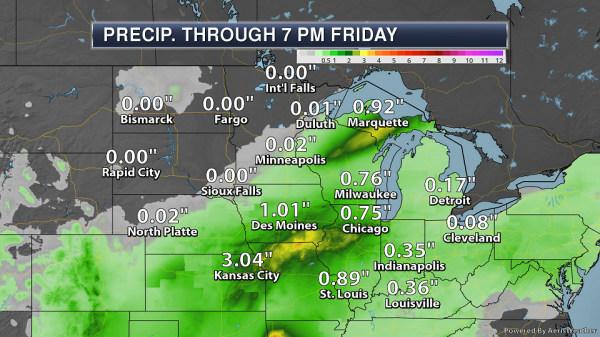 The potential of more heavy rain across this region exists, especially across northern Missouri Friday. We’re also tracking Hurricane Florence currently out in the middle of the Atlantic. This system doesn’t pose a threat to land over the next five days, but there is uncertainty in the models as to the overall track of the system after that point. We will also be watching a couple other waves that are moving off the Africa coast that have the potential of becoming tropical systems in the next five days. Tropical Depression Gordon. 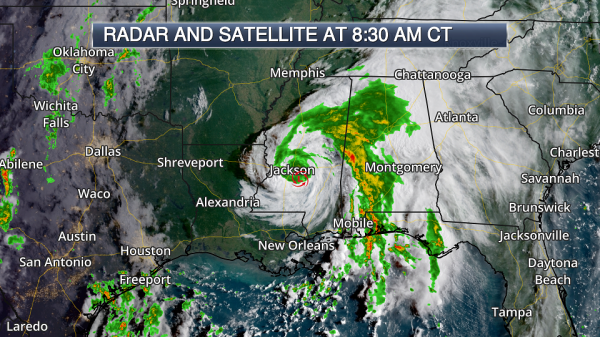 Gordon made landfall last night around 10:15 PM just west of the Alabama-Mississippi border with sustained winds of 70 mph. Since then, this system has continued to move further inland and quickly weaken. As of the 7 AM update from the National Hurricane Center (NHC), Gordon had sustained winds of 35 mph and was moving to the northwest at 14 mph. All tropical storm and storm surge warnings have been canceled along the Gulf Coast. Map: AerisWeather. Rainfall So Far. 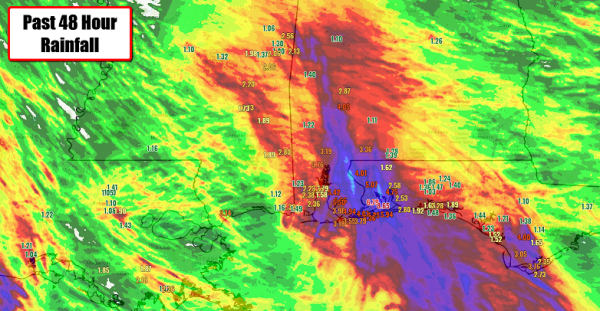 Some of the heaviest rain in association with Gordon has fallen across parts of southern Mississippi, southern Alabama and the panhandle of Florida, with some 6”+ totals reports. Over the past 48 hours, 8.65” of rain has been reported at the Pensacola airport, and there have been reports of flooding in the Mobile area. Expected Path. Gordon will continue to weaken as the system moves further inland over the next couple days, moving to the northwest with a decrease in forward speed. 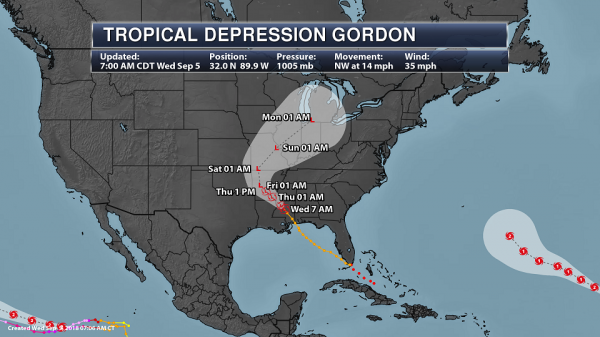 By late in the week and the weekend, Gordon will turn north and northeast across the midsection of the nation. Even though Gordon continues to weaken, the system will continue to produce heavy rain along its path over the next several days as well as occasional gusty winds. Map: AerisWeather and Praedictix. Heavy Rain Threat From Gordon. An additional 2-8”+ of rain is possible along the path of Gordon through Friday evening from the Gulf Coast to Arkansas, with some additional moisture from Gordon streaming northward into parts of Missouri, Iowa, and Illinois through early Saturday. 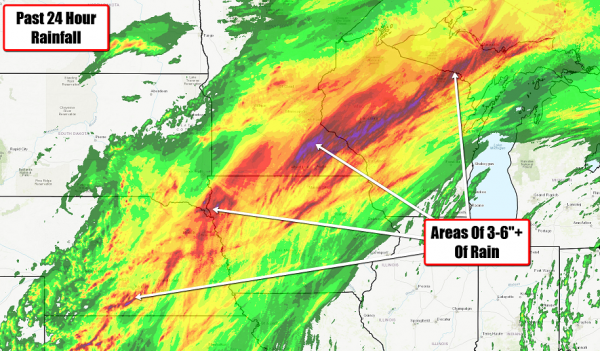 Some isolated 12” amounts are possible in areas that receive the heaviest rain bands. This rainfall will cause the potential of flash flooding across the region. Flash Flood Watches. 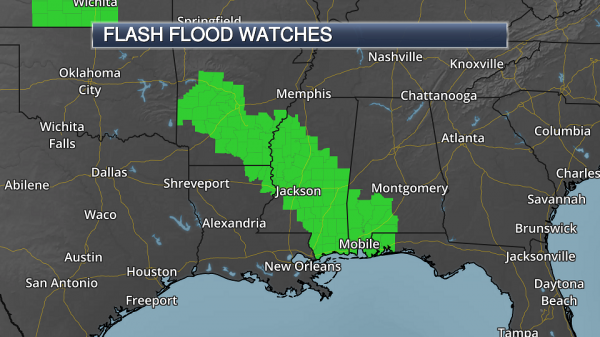 Due to the continuing threat of heavy rain in association with Gordon, Flash Flood Watches continue to be in effect from the northern Gulf Coast into Arkansas, including Mobile, Jackson, and Little Rock. Today the highest threat exists from the Gulf Coast to lower Mississippi Valley. Thursday the highest threat area moves across Arkansas. Friday the highest threat area covers parts of western Arkansas. 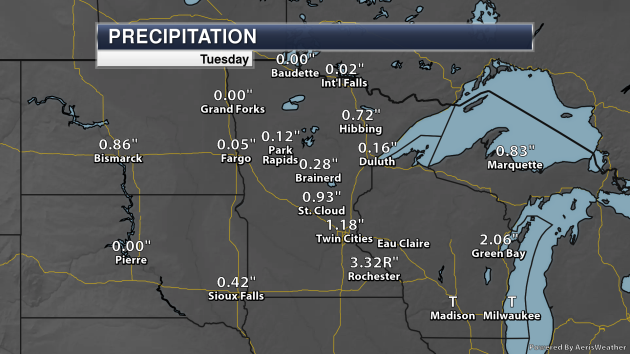 Heavy Rain In The Upper Midwest. Separate from Gordon has been heavy rain that has been falling with a slow-moving frontal system across parts of the upper Midwest. Bands of 3-6” of rain have fallen from northern Kansas into the upper peninsula of Michigan, with some reports of flooding across this region. 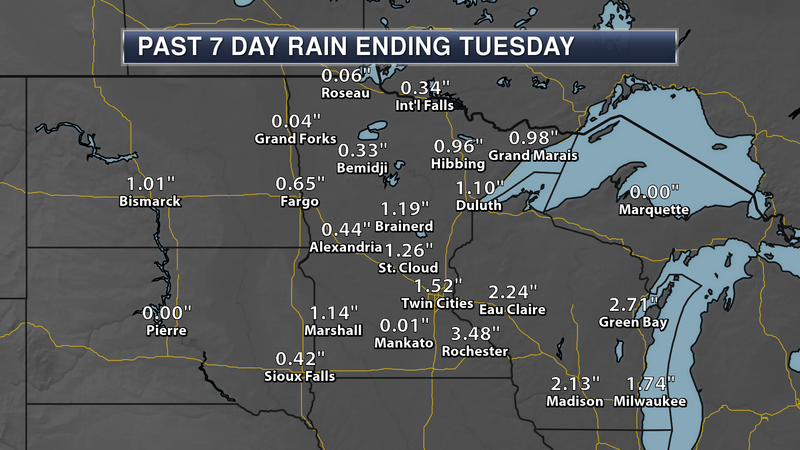 Some areas even saw record rain amounts on Tuesday, including Rochester, MN (3.32”), Sioux City, IA (2.65”), and Rhinelander, WI (2.81”). Midwest Rain Threat. The heavy rain threat will continue across parts of the Midwest over the next several days with a slow-moving frontal system that will eventually stall out across parts of the Central Plains and Ohio Valley by the end of the week. By the end of the week, however, some moisture from Gordon will start to get wrapped into the region, helping to increase the heavy rain threat. Two areas of heavy rain are expected over the next several days – one across Wisconsin and the upper peninsula of Michigan which will be coming to an end throughout the day, and a second across parts of Iowa, Missouri, and Illinois for the end of the week. Flash Flood Watches. 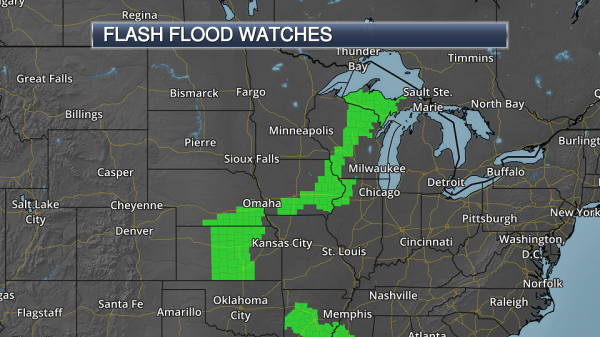 Flash Flood Watches continue through the midday hours today from Kansas to the upper peninsula of Michigan due to the potential of additional heavy rain in spots this morning. Moderate Flood Risk Friday. 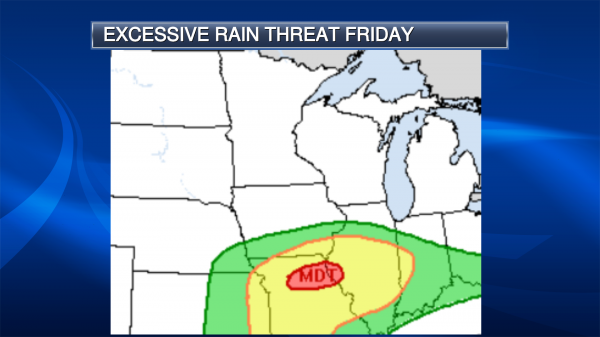 With moisture starting to stream north toward the front on Friday, the potential of heavy rain and flash flooding will increase across parts of northern Missouri and western Illinois. 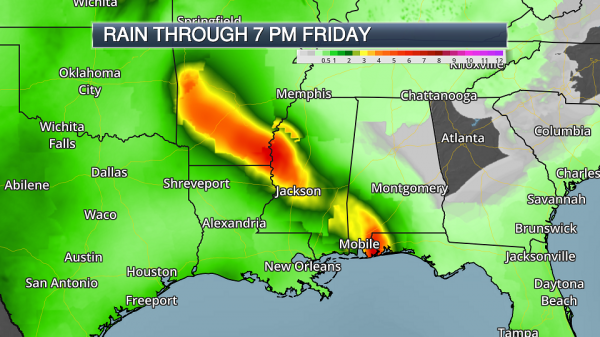 The Weather Prediction Center has this area in a Moderate Risk of excessive rainfall that could lead to flash flooding as models are indicating the potential of 3-6” of rain along the front. Watching Florence. We are also keeping an eye on another tropical system out in the Atlantic – Hurricane Florence. As of Wednesday morning, Florence had winds of 120 mph (becoming the first major Atlantic hurricane of 2018) and was moving to the west-northwest at 10 mph. 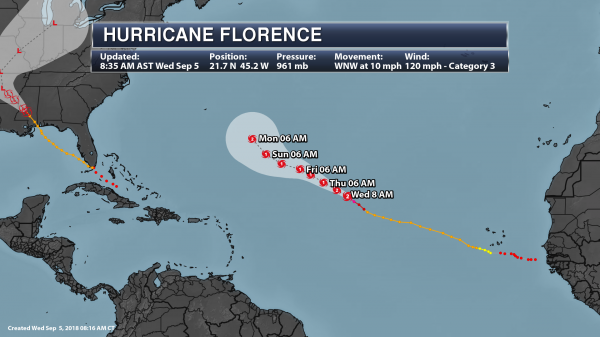 The center of Florence was located about 1,185 miles east-northeast of the northern Leeward Islands or about 1,405 miles east-southeast of Bermuda. While this system will pose no threat to land over the next five days, there is uncertainty in the models as to the overall track of the system after that point. It is something we will keep an eye on over the next several days, and provide updates as needed. 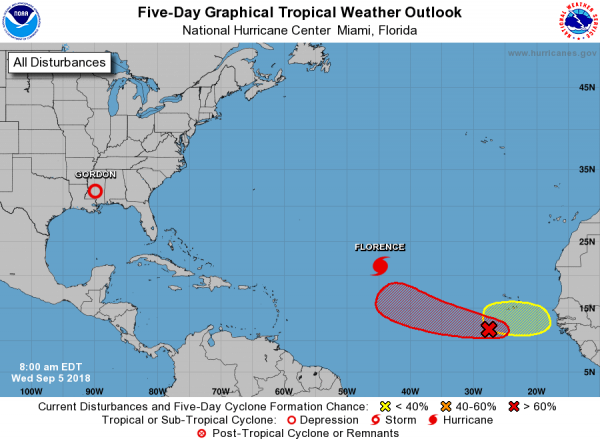 An area of low pressure a few hundred miles south-southwest of the Cape Verde Islands has slowly become better organized over the past day or so. It has a 50% chance of formation in the next two days, and 90% over the next five days. A wave that is getting set to move off the Africa coast in a few days has a 30% chance of formation in the next five days. Hurricane Lane Was the Second Wettest Tropical Cyclone on Record in the U.S. Here's a very good overview of Lane's impact on Hawaii at Forbes: "Hurricane Lane left its mark in Hawaii without ever making landfall. The hurricane now holds the notorious distinction of producing the second-highest rainfall total ever measured in a tropical cyclone in the United States. A rain gauge on Hawaii’s Big Island measured 52.02” of rain during Hurricane Lane, cementing the hurricane’s status in the record books. Hurricane Lane threatened Hawaii last weekend on a path that’s extremely unusual for tropical cyclones in this part of the Pacific Ocean. While most hurricanes only graze Hawaii to the north or south, Lane approached the state from the south and stalled-out not far from the island chain. Despite the hurricane never making landfall, the storm’s proximity led to several days of intense rains pummeling the islands..."
Image credit: "3-day rainfall totals in Hawaii from Hurricane Lane." NOAA/NWS Honolulu. The Economic Impact of Hurricanes. The Houston Chronicle has a timely Op-Ed; here's a clip: "...Perhaps the most unexpected finding in the research was the impact on health care spending, even months after landfall in both Miami and Houston. During the week of landfall, spending at health care providers was 65 percent and 53 percent lower than baseline in Houston and Miami respectively. Twelve and 10 weeks after landfall, that number still had not recovered, with health care spending 5 percent below baseline in Houston and 4 percent lower in Miami. This raises a critical question with significant policy implications: Was the slowdown in health care spending caused by a drop in demand — as consumers sought less care and spent on more immediate needs — or by disruptions in health care supply, as a result of the hurricane?..." Photo credit: "A neighborhood is inundated by floodwaters from Tropical Storm Harvey near east Interstate 10 in Houston on Tuesday, Aug. 29, 2017." Photo: Brett Coomer, Staff / Houston Chronicle. How to Prepare for Extreme Weather. A post at care2.com has some good reminders: "...A recent Esurance survey found that the majority of U.S. residents have experienced at least one major weather catastrophe in the past 5 years. Taking steps to plan for extreme weather is important if you’re a homeowner. While you’re preparing yourself and your home for Mother Nature’s worst, you can also do something good for the planet. Bring along copies of important documents or store them in a water- and fire-proof safe at home. Pack adequate food and water supplies for yourself, family members and pets. Turn off electric, water and gas utilities to the home. 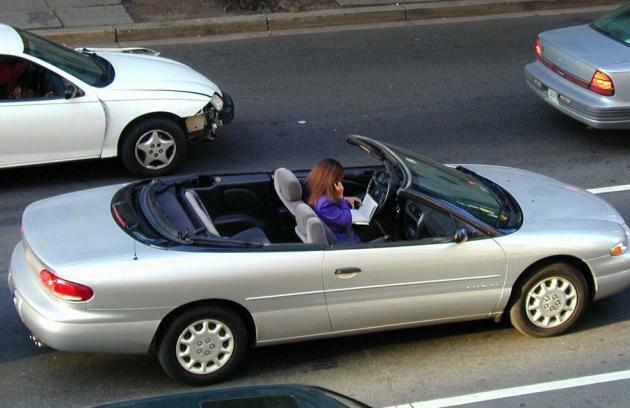 Check your homeowner’s insurance policy so you know what weather-related damage is covered..."
Twin Cities Rank Low on America’s Best Drivers List. Wait, we're bad drivers? Only during winter and road construction. Which leaves early October, when we drive very capably. Bring Me The News reports: "As Minnesotans, we're pretty confident that we can drive with the best of 'em, all that experience driving through big snowstorms and whatnot. But apparently all of our winter driving experience plays into a surprisingly low ranking in Allstate's best drivers in America report, which ranks Minneapolis 127th among the 200 largest cities in the country. The average driver in Minneapolis goes 7.7 years between auto insurance claims, which is tied with cities like Memphis and Chicago, but ranks well below the best of the best..."
Pole-Dancing at Chinese Nursery Shocks Parents. BBC News has the jaw-droppping account: "A Chinese nursery has come under fire for having a pole dancer perform at its welcome ceremony, it's reported. According to the Southern Metropolis Daily newspaper, parents and children were invited to attend the opening ceremony of the Xinshahui Kindergarten in the southern city of Shenzhen on 3 September. As part of the program, families were invited to watch a number of female performers perform in skimpy clothing, including a pole dancer..."
Image credit: "Both parents and children watched a pole dancer perform at a Chinese preschool." 73 F. maximum temperature yesterday in the Twin Cities. 76 F. average high on September 5. 65 F. high on September 5, 2017. September 6, 1977: An early morning thunderstorm drops 2 inch hail in McLeod County. September 6, 1922: A heat wave over Minnesota brings highs over 100 to southwest Minnesota. One of the hot spots is New Ulm with 105. AP Explains: Driven by Climate Change, Fire Reshapes U.S. West. Here's an excerpt of a post at Fox News: "...Scientists broadly agree wildfires are getting bigger in North America and other parts of the world as the climate warms. But still emerging is how that change will alter the natural progression of fire and regrowth. The time interval between wildfires in some locations is getting shorter, even as there's less moisture to help trees regrow. That means some forests burn, then never grow back, converting instead into shrub land more adapted to frequent fire, said Jonathan Thompson, a senior ecologist at Harvard University. "They get stuck in this trap of repeated, high-severity fire," Thompson said. "Through time we'll see the California shrub land shifting north." 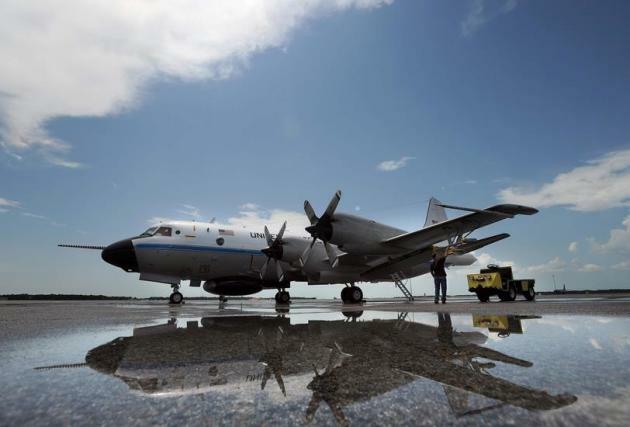 Similar shifts are being observed in Colorado, Wyoming's Yellowstone National Park and Glacier National Park in Montana, he said..."
Climate Change Will Make El Nino/La Nina Impacts Stronger, Study Says. Houston Public Media has a summary of new research: "The recurring climate patterns known as El Niño or La Niña will lead to stronger storms and wildfires as the planet warms, according to a new study from the National Center for Atmospheric Research. In an El Niño period, Pacific Ocean temperatures are warmer than usual, bringing cooler, wetter weather to Texas. The opposite happens with La Niña, which leads to hotter, drier weather. The study, published in Geophysical Research Letters and led by John Fasullo, says those weather impacts will be amplified by overall global temperature increases. That means more chances for wildfires and, particularly on the Gulf Coast, flooding..."